Plaza Gamboa s/n, 18009 Granada, Spanje. 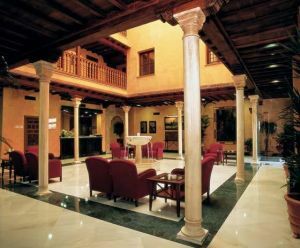 Hotel Hesperia Granada has the privilege of being located in Granada historical centre, at a few steps from the walk going up the Alhambra, in front of the Town Hall and beside the pedestrian area. It has been raised in a historical building recently renovated and reopened where every detail has been treated with care, as the archs, lintels and Mudejar style columns show. The hotel's large rooms create a warm and pleasant ambience that makes the guests feel at home. The hotel is surrounded by all kind of craft shops, flea markets, restaurants, tea rooms and corners filled with the exotic flavour of the city. 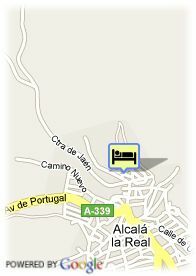 It is only 15 kilometres from the Granada Airport.